Katie felt herself relax. For the first time, she was relieved to see someone’s injury turn out to be a bullet wound. It wasn’t a bite and so he wouldn’t turn. Not that he was out of danger, but a bullet wound they could treat. “How did it happen?” Katie said, lowering her weapon and indicating that he should sit down on the couch. He did so with an exhausted grunt. His eyes closed for a moment but opened again and was about to speak when a loud thump came from the door. Then another. And another. Soon, they were rapid and demanding. The Infected had come down the steps. Mr Petersen hauled himself to his feet again and looked around, perhaps for a weapon. Mrs Petersen put a hand to her mouth and pointed. Katie heard her whisper, “Oh God, not again…” Jon stood in front of his parents, his hands balled into fists. Like that would do them any good, Katie thought. “It’s okay,” Katie said, safetying her rifle before pulling it off her tactical strap. She disarmed it, reloaded the chambered bullet into the magazine and put the weapon and ammo where she could easily reach it. No sense in not being prepared, just in case. They were all looking at her like she was crazy. Waving a hand towards the door she smiled. “Someone should look at that wound,” Lindsay said, appearing in the room with the first aid kit. She immediately jumped, her eyes going wide at the thumping on the door. Her eyes turned to Katie, who shook her head. She seemed to take that as all the affirmation she needed and moved over towards the couch. In time, the others seemed to accept Katie’s word as well, though almost two minutes passed before Mr Petersen would sit back down again. “Show Lindsay too,” Katie said, having taken a step towards the couch but stopped. She already knew how to clean and sew a wound. Another one of dad’s skills hammered into her over the years. She wondered if her friend could willingly shove a metal needle into flesh and bind it closed. For that matter, could she? They’d only really practiced on deer hide. What if she couldn’t do it? Yeah, Lindsay should definitely learn how, she thought with a grimace. Just in case. Blushing. Oh Christ, Katie thought as she followed Lindsay’s gaze to Jon. This was the very last thing she needed. Really, Lindsay? During the goddamned end of the world? No, she thought, cutting off that train of thought immediately and clicking on monitors. The Infected were swarming the bunker entrance, which was bad, but there was no way through the steel door. The back door, buried a dozen yards away was a little easier to get through, but it was still hidden. Besides, even that was made of steel and tough as nails. They were safe in here. She wasn’t sure what she’d tell him about the Petersens, not yet. Every survival instinct about the bunker was to lay low and not attract attention. Inviting others in and bringing down a small horde on their location was definitely not laying low. If anyone saw it, they might wonder what the hell the Infected were doing. Eventually, they’d wander off, leaving any observers free to check out the area. Humans were smarter than Infected and might find a way around that door. Katie didn’t see how, but there was always a possibility. Granted, anyone in the area would have seen the huge helicopter leaving too. She wondered if that’s how the Petersen’s found the location. They’d been to the bunker before but that was two years ago and it wasn’t exactly marked on a map. “How’d you find us?” she said, turning to look at Mrs Petersen. Now, up close, Katie noticed she was sweating and flushed. That run must have been terrifying. She considered finding some aspirin in their supply room. It thinned the blood and could prevent a stroke or heart attack if her blood pressure elevated too high. Mrs Petersen turned to look up at her. She was sitting on the floor with her back against the wall. Her eyes were dark and bloodshot. Katie saw that her lips were dry and cracked but still had traces of pink lipstick. Oddly, Katie also realized she wore no wedding ring on her hand. She might not have noticed it if Mrs Petersen didn’t raise her left hand to her own cheek. The fingers shook as they wiped her cheek but, finding them dry, quickly dropped away again. “No, no Patrick could have. He’s very, um, tenacious about such things.” Mrs Petersen’s eyes would not raise to meet Katie’s. Shame wasn’t a completely uncalled for reaction. If he’d built that bunker, they might be safe and secure in it now. Mr Petersen might not have been shot. “We were at the airport when it, ah, happened. The streets were, well…” Mrs Petersen shut her eyes and leaned her head back against the wall. For a time, nothing happened and Katie thought she might have passed out or fallen asleep. Katie couldn’t exactly blame her. But, a few moments later, they snapped open and she gasped. Her eyes were worse. It was like she hadn’t slept for days. The redness was far worse, an angry hue that seemed to reach out for her pupils like angry tendrils from the corners of her eyes. Her breath was ragged and she began to cough. “Vicky?” Mr Petersen said and was suddenly there. His shirt was back on and he knelt before his wife. With one hand he reached up and touched her forehead. Katie began to feel panic in the pit of her stomach. Slowly, she backed away from them. The coughing became worse and as she backed away, she saw the blood that collected on Mrs Petersen’s lips. Her husband removed her suit jacket, revealing an angry, dark wound on her right forearm. Katie could tell it was a bite. The signs were all there. Lindsay’s shout made Katie turn her head. Her friend was still by the couch, her hands held out, as if pleading. One of them still held scissors and a roll of tape. There was the sound of a rifle being armed, the bolt charged. Katie knew that sound very well. It came from her own rifle. She turned to see Jon holding it, the barrel pointed at her head. 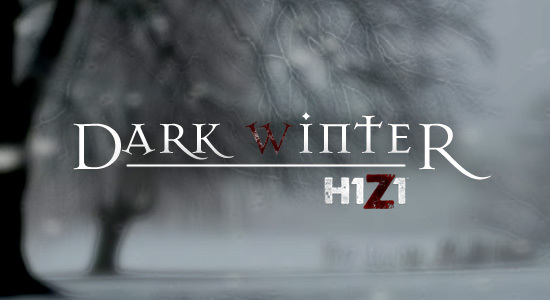 This entry was posted in Dark Winter, Fan Fiction and tagged Dark Winter, Fan Fiction, H1Z1, SOE, Zombie Apocalypse, zombies. Bookmark the permalink.